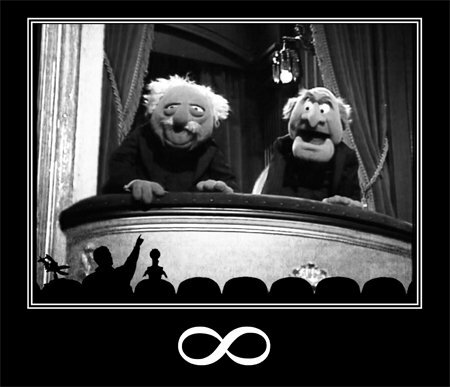 (Lifted from http://www.chilligansisland.com/2009/09/27/statler-waldorf-vs-mystery-science-theater-3000-there-can-be-no-winner/ , though I have seen it elsewhere too...I don't know whose it was originally, or else I would credit them. Because this is Just Brilliant. Did you know that people are fixing to cut funding to Graduate Medical Education? Yeah, you know, the thing that actually allows us to make new doctors, while we’re in a PHYSICIAN SHORTAGE?! Everyone’s trying to cut costs. But cutting primary education, infrastructure, and the funding that allows us to pump out the people who make sure you don’t die when you are in a car accident seems like a stupid, stupid move. You know what would take a significant chunk out of health care costs? In one fell swoop? That’s right. All you private companies with your New! Improved! EMR Systems! need to take a bow and just disappear…instead of the doctors who use them. Cerner, Quadrumed, Sunrise, and all of you other overcomplicated, hypofunctional EMR systems…I’m sorry, but we just need to end this relationship. It’s not me, it’s you. Do you have any idea how much time, money, and resources are spent repeating workups? A lot. A. LOT. This problem is exacerbated by the fact that patients now have a tendency to bounce from hospital to hospital, shopping for who knows what. At every hospital, basically the same workup is done. And it’s practically impossible to get records from previous hospitalizations, even if a patient signs himself out of one hospital and goes straight to another one. (This happens all. the. time.) So what does hospital number two do? Exactly the same thing that was JUST done at hospital number one. But Dr. Grasshopper, I hear you saying. Why can’t the patients just fill you in on their medical history when they come to the hospital? What medications are you taking? I dunno. It’s in the computer. What illnesses have you had in the past? I dunno. It’s in the computer. Have you ever had any organs removed? I dunno. It’s in the computer. This happens even at hospitals that DON’T USE ELECTRONIC MEDICAL RECORDS. Okay, okay. I’d be a fool to expect Americans to take responsibility for their own health history. It’s absurd to ask someone to write down their medication regimens on a piece of paper when they go for a doctor’s appointment or present to the emergency department. It’s pure idiocy to expect people to remember whether or not they ever gave another human being permission to slice their bodies open and fiddle around with their insides. But if we’re going to allow patients to abdicate their responsibility toward knowledge of their own bodies and make the healthcare providers solely responsible for the information required to treat people correctly, effectively, and inexpensively, then THERE HAS TO BE A RELIABLE WAY OF COMMUNICATING INFORMATION BETWEEN PROVIDERS. Except in one sector: The Veterans’ Affairs hospitals. It’s because of a program called CPRS. Let me be the first to acknowledge that CPRS is an imperfect EMR program. But it is far LESS imperfect than any other system I’ve worked with. The biggest advantage of CPRS is that the medical history, imaging, and previous test results of any VA patient who presents to any VA hospital in the country is immediately accessible, no matter which VA hospital they had been to previously. I could go into details about the time, energy, and healthcare errors that are saved by such a simple thing, but I just don’t have the time or the energy to try and convey that kind of ENORMOUS MAGNITUDE. Here’s my proposal: extend CPRS to all hospitals that use electronic medical records. All of them. We’ve already paid for the development of this system; CPRS was taxpayer-funded. So make the investment that would be needed to dump all of the other overpriced systems-of-marginal-utility and transfer them over to one, centralized repository of patient information whose design and development we have already paid for. And then just do it. It has to happen. Electronic medical records are awesome, but like everything else in medicine, you can’t get a benefit without a side effect. And the biggest side effect I’ve noticed from EMR systems is that everyone outsources their knowledge of their own medical situations to some amorphous, all-knowing Computer. And from what I’ve seen, that’s not likely to change any time soon. So why not just make it a reality? It would make life easier for everyone, doctors and patients alike. -Shorter wait times in emergency rooms, as doctors won’t have to sit and painstakingly try to reformulate by trial and error the magical sequence of questions that will drag useful information from forgetful, uncommunicative, or unengaged patients and family members. Doctor/patient time can then be spent with far more meaningful and fruitful interactions. -Drastic decrease in healthcare spending; you’d be horrified at how often the same tests and imaging are repeated, just because the results of previous tests cannot be found in time to contribute to medical decision-making. Well, you might not be horrified, but I am. On a multiple-times-daily basis. -Fewer medical errors, since medical providers will be able to make decisions based on the most complete set of information possible, instead of the slapdash patchwork of patient recall, previous records (if you can ever find them), and possibly-misleading-test-results-that-wouldn’t-actually-terrify-you-and-lead-you-to-do-a-full-panicked-workup-if-only-you-knew-that-the-patient’s-result-has-been-at-that-same-bizarre-level-for-the-past-fifty-years-and-it-has-never-made-any-trouble. Everyone currently employed by the useless-and-now-defunct-if-this-proposal-takes-hold EMR companies can devote their energies to the security and functionality of the centralized repository. What other single piece of policy change would have such a drastic positive effect on this broken, broken system? I dunno. It’s in the computer. The worst thing about being a doctor is taking away hope with your words. You can see it die. If you’re not numbed by repetition, you can feel it, too. One of my patients had been hit by a car, and he was in the ICU barely hanging onto life. The pressure in his head was so high that it interfered with our ability to manage his other medical problems; everything we did had to be balanced against the intracranial pressure. Our hands were basically tied. We did everything. But he kept on deteriorating. Today I told his sister that his kidneys had finally failed, joining his liver and his heart. I could see in her eyes that that was the moment she knew he was gone. He only lasted eight more hours. Here I stand, spent and empty, with nothing more to struggle against. All I can do is watch his sister grieve. Official Declaration: Daylight Savings Time Is Stupid. Time is an artificial construction, measured only by agreed-upon convention. The only purpose of measuring time with a clock is to coordinate action. The actual numbers on the clock don’t matter; the clock says whatever we as a society agree that it should say. So, I propose that as a society, we mutually agree that Daylight Savings Time unnecessarily complicates matters, without adding any benefit. Don’t talk to me about energy savings, because when Indiana made the poor decision of switching to Daylight Savings Time in order to conform to everyone else’s idiocy, energy consumption went UP 3%. Oh, and Indiana is a farming state, so I don’t want to hear about how important it is for farmers to have DST. If you need extra daylight, GET UP AN HOUR EARLIER. It’s that simple. We don’t need to all change our clocks at the same time to accommodate you. Wouldn’t you rather see the days get naturally shorter and longer, the way life is supposed to be? I grew up without DST, and I gotta tell you, clock-changing days STILL feel like existential whiplash even after ten years. Daylight Savings Time is outdated, annoying, unnatural, bestows no added benefit, and only serves to remind us how arbitrary our measurement of time truly is. There is no reason for us to cling to this absurd practice. How can I get it changed? You Think Your Doctor Orders Expensive, Unnecessary Tests? Since I just got finished with a really obnoxious, expensive exam whose results won’t be used for anything but I was required to take it anyway….I’m thinking about standardized testing. So that means you’re going to read about it. I’ve gone through all the standardized exams I can remember paying for, from high school through the time when I will sit for my licensing exam. Whenever possible, I used the testing fees that were true around the year I took the exam. Here’s what it costs to sit for the exams you have to sit for in order to become an Internal Medicine physician in the US. Starting in high school. So, let’s review. In order to get to the point where I can practice Internal Medicine in a board-certifiedly manner, I have to pay a grand total of $4333.50….JUST for the exams. Just so I have permission to walk into the room and sit down at a desk. That doesn’t include the absurdly expensive preparatory materials that you basically have to use because otherwise you’re screwed (which are often FAR more expensive than the exams). That doesn’t include extension fees, in case you miss your appointment through extenuating circumstances. That doesn’t include travel costs (Step 2 CS is only offered in five cities IN THE WORLD). That doesn’t count the shelf exams whose costs are folded into med school tuition, or my in-service exams that are covered by my residency program but undoubtedly come out of my paycheck somewhere. As of 2005, there were 67,000 people going through this process. Assuming a constant flow of people from medical school to residencies, that’s $290,344,500. Per year. JUST FOR ADMISSION TO THE EXAMS. NOTHING ELSE. And fees tend to increase as time goes on; I’ve never seen a fee for anything decrease, ever. Someone figured out how to make an awful lot of money off this whole standardized testing thing, didn’t they. Don’t even get me started on the test prep industry. If these exams were all relevant, maybe I wouldn’t complain so loudly. But a good number of these tests are completely useless. The PSAT and the SAT cover the same material, if I recall correctly. The SAT II subject exams don’t really serve much of a purpose. Step 1 tests basic science, but that kind of thing can be left to the medical schools; they’re already paying for the nationally standardized shelf exams for each subject. Or we could throw some of it into the Step 2 CK exam. Scrap Step 2 CS entirely; it’s a swindle. Likewise Step 3, which covers the same material as Step 2, except they try to make it fancy so you don’t notice. If we absolutely have to hammer learners into the ground with national standardized exams: Test high school stuff with the SAT, and use that score for admission to college. Test collge-level science with the MCAT, and use that score for admission to medical school. Test med school learning with the Step 2 CK exam (and mix in a little bit of Step 1 material if you seriously think that people can understand more advanced medical concepts without mastering the basics). Use Step 2 to screen residency applicants. And then let people learn the freaking material for their own freaking specialty, and make sure they learned it by giving them the Board Exam. Maybe we could keep the PSAT (just because I got the National Merit Scholarship from that baby). That’s all. Nothing more needed. Don’t students and trainees have enough debt already?